Board of Intermediate and Secondary Education Rawalpindi was established in October, 1977 as a result of bifurcation of BISE Sargodha under Punjab Boards of Intermediate and Secondary Education Act No. XIII of 1976. The BISE Rawalpindi has been confined to the Districts of Attock, Chakwal, Jhelum and Rawalpindi. 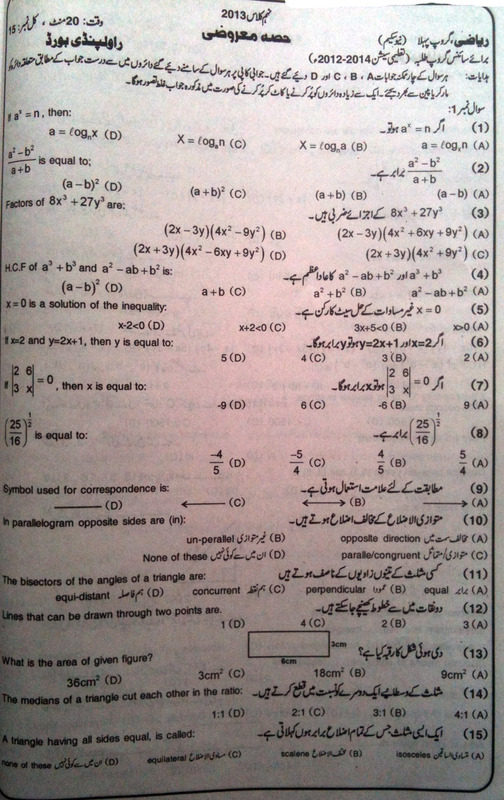 please send English chemistry physics old paper for class 9th Rawalpindi board. shukeryia Kamran bahi ma nay app ko add kar liya hia app kiss time online aty hoo ?? Plz send me 10th science guses2015 or past papers on ( coolmalik788@gmail.com) or send my phone number (03355210155) Thanks ……………..